Other behavior models dispute this finding with a claim that the “human factor” is not considered and these studies indicate that multiple lines are more efficient primarily, because cashiers move faster when they have their own dedicated set of customers. They also claim the mathematical models don’t consider the customer behavior of line switching which reduces the efficiency disparity between the single and multiple queue. Historically, grocery retailers have chosen the multiple line model. Recently, however, some notable retailers have experimented with the single queue. We’ve seen recent trials in a variety of grocery formats in the U.S. and abroad – traditional regional grocers, hypermarkets, mass merchandisers and natural food stores – and customer reviews are mixed. We personally asked customers at one of these trials what they thought of the single queue. Half said they loved it and the other half were very vocal about their dislike. We also asked some of these retailers why they implemented a single queue. Our observation is that there is no “right” queue type; there are multiple factors to be considered when determining which queue type should be used. The following outlines what we’ve learned about single versus multiple queues from our customers. If your customers are predominately small basket shoppers, transaction times will be similar, so a single queue can provide a consistent level of service. The single queue can also be used when most of your customers are large basket shoppers However, lack of space to queue up the trolleys may rule out this option. If you have a mix of single-item, small basket and trolley shoppers, consider your objective. Is your goal to provide a system that ensures the first person in line is the first to be served? If so, a single queue will achieve this objective. Is your goal to push the small basket shoppers to utilize self check-out? If so, a single queue might drive this behavior – particularly at certain times of the day. Do you consider it acceptable for someone with a single item or a small basket to experience a shorter wait time than a customer with a large basket? If so, by splitting these customers into separate queues, you can still provide a consistent level of service, albeit it a different one based on the customer’s basket size. There are a variety of configurations that might work for you. Store layout and volume will likely impact which configuration you choose. Two single queues – one feeding a bank of registers for small basket shoppers and a second feeding a bank of registers for trolley shoppers. A single queue for the small basket bank of registers and multiple queues for the trolley shoppers. If you’re planning a single queue, consider the distance between the head of the queue and the furthest register. 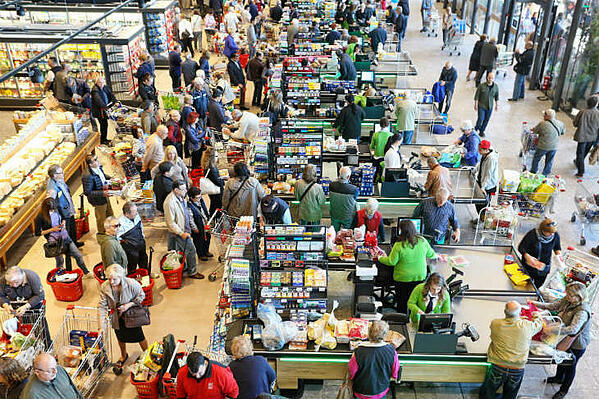 If the head of the single queue is positioned 15 lanes away from the furthest checkout, customers may be wasting time walking to the furthest register. For stores with long front ends (more than 10 registers), consider a call-forwarding system or positioning an associate at the head of the queue to direct customers to the next available line, ensuring that there are always groceries on the belt. Even if your single queue is being served by a large bank of cashiers and is moving quickly, the appearance of a line of 10 or 12 shoppers might be discouraging to your shoppers. Providing them information regarding their expected wait time could address indecision about joining the queue. Also, if you are available to ‘hide’ the queue or portions of the queue, this might reduce customers’ apprehension. To effectively utilize your cashiers, you need to ensure that they are serving customers equally. We encourage our customers that utilize multiple queues to have a supervisor balancing the lines. However, research does show (and our customers feedback supports this) that customers that can choose their own line believe that they have some control over how long they wait, and if they choose the ‘wrong’ line, it’s their own fault, not the retailers. There are also those customers that have their favorite cashier, albeit this is more of a generational thing. When determining how to queue up your customer, considering the above factors can help you provide the best service. For more information about how Irisys can help you improve customer service and satisfaction, please contact us at sales@irisys.net.